Asta, all we can do is lower the dosage and see if symptoms lessen. If they do, you know it's the trazodone causing your symptoms. Your notes are good, please continue posting them. 7 am - bones pain, feeling like anxiety begins right now (very very low - short time). 7.30 am - very low fear, low internal shaking (short time). 7.50 am - 9.40 am - feeling like anxiety begins right now, little nervousness (low with interruptions). 9.20 am - 2pm lethargy. 2.20 pm - feeling like anxiety begins right now (very very low - short time). 4 pm - feeling like anxiety begins right now (very very low - short time). 9 pm - feeling like anxiety begins right now (very very low - short time). Emotional instability, crying (all day with interruptions). 6 am - feeling like anxiety begins right now (very very low-short time). 6.40 am - nausea (short time). 7.30 am - 8.30 pm - feeling like anxiety begins right now (very very low with interruptions). 9 pm - feeling like anxiety begins right now (stronger - short time). SLEPT FOR ABOUT 4 HOURS. 8 am - 9 pm - feeling like anxiety begins right now (very very low with interruptions). 7.30 am - nause (short time). 8.20 am - low internal shaking . 10 am - 11.30 am - lethargy. 6 am - 8.30 pm - feeling like anxiety begins right now (low with interruptions). 8 am - 9 pm - feeling like anxiety begins right now (low - all day, with interruptions). 9 am - low internal shaking (short time). 1 pm - bones pain, headache, nausea, thirsty (short time). 7 am - feeling like anxiety begins right now (very low-short time), nausea (short time), bones pain. 7.30 am - feeling like anxiety begins right now (very low short time). 8 am - feeling like anxiety begins right now (very low - short time). 9 am - feeling like anxiety begins right now (very low - short time). 10 am - feeling like anxiety begins right now (very low - short time). 10 am - low internal shaking (short time). 12.30 pm - feeling like anxiety begins right now (very low - short time). 6 pm - very low fear, feels like something will happen (short time). 6.40 pm - feeling like anxiety begins right now (very low - short time). 9.20 pm - feeling like anxiety begins right now (very low - short time). 7.20 am - very low fear, feeling like anxiety begins right now (very very low- short time). 8 am - very low fear, very low nervousness, low internal shaking. 8.20 am - low fear- feels like something will happen (short time). 8.40 am - short-term air deficiency, feeling like anxiety begins right now (stronger - short time). 3.30 pm - feeling like anxiety begins right now (very very low - short time). 4.20 pm - feeling like anxiety begins right now (very very low - short time). 6 pm - 7.30 pm - feeling like anxiety begins right now (very very low). 8 pm - feeling like anxiety begins right now (stronger - short time), emotional instability (short time). 9 pm - ear and throat pain (short time), bones pain. 5 am - feeling like anxiety begins right now (very low-short time). 6 am - feeling like anxiety begins right now (very low-short time), bones pain, nausea (short time). 7.20 am - feels like something will happen, emotional instability, low internal shaking (short time). 8 am - 9 am feeling like anxiety begins right now (stronger). 9 am - 10 am - little nervousness. 12 pm - nervousness, lethargy, hopelessness, emotional instability (all day with interruptions). 2.30 pm - feeling like anxiety begins right now (low - short time). 5 pm - feeling like anxiety begins right now (low - short time). 6 pm - strong bones pain, lethargy, hopelessness, crying. 7 pm - feeling like anxiety begins right now (low - short time). 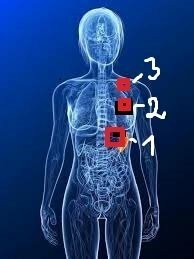 9 pm - feeling like anxiety begins right now (low - short time), bones pain. At night strong bones pain, short-term air deficiency. 7 am - strong bones pain, nausea (short time), feeling like anxiety begins right now (very low - short time). 7.30 am - very low fear. 8.40 am - feeling like anxiety begins right now (low - short time). 9.30 am - nervousness, thirsty. 4 pm - feeling like anxiety begins right now (low - short time). 6 pm - feeling like anxiety begins right now (stronger - short time). 8 pm - feeling like anxiety begins right now (short time). Is the bones pain worse at night? Does it start after you take trazodone? Does it go away in the daytime? When you say "anxiety begins" -- are you getting little waves of anxiety? Have your daytime symptoms gotten worse or better since you reduced trazodone? @Altostrata thank you very much for your care. Join-bone pain is bigger at night and in the morning. It is better at day time. Maiby because I move and walk. With less dose of Trazadone my symptoms are similar as it was.I have some new-old symptoms they were gone and now they came back with lowering a dose, but are very mild and short in time. I call anxiety a scary feeling in my chest, because i don't know how to call it otherwise. I had that feeling before when stopped Encitalopram, it was very very strong, it looked like I am gone loose my mind. It was there all the time and moved around (picture 1, 2, 3). It felt like some very fast going on engine...Later it came back less times per day, but strong as it was. With time passing by it got milder and softer, lesser times per day. As today, this feeling is milder then before, but it comes often and just in one place (picture 1). I noticed, after lunch, every time and it doesn't matter what I eat, the very very mild feeling is coming back and after couple hours gets stronger, then it's disappearing...The feeling alternates all the time. I don't know if I can call it anxiety or it is something different. There is a spleen in that place, maiby it has something to do with this, I just thinking.The sudden cut of pills before did a big impact to my body, I think. I had that feeling, but milder, when I started pills in the begging and after six week of using them the feeling was gone. That is a good picture. Since the symptoms are getting milder and your sleep pattern hasn't changed, it seems you're going in a good direction reducing trazodone. You might be having a reaction to the prior night's trazodone during the day. As you reduce the trazodone, this gets less. Try a little bit of one at a time to see how it affects you. @AltostrataDo you know maiby from your experience what is that scary feeling in my chest? It is anxiety or some dysfunction of my body's organ? Can it be a spleen or adrenal glands? The feeling is softer than it was before, but it it stays almost all the time. It gets stronger sometimes and it's every overwhelming feeling. Maiby what the pills did to me is not fixable? The feeling this morning was very soft, but I had brain fog, I was feeling dope and despondent. Brain fog was gone after I eat lunch, but an anxiety feeling gir stronger. How it comes is connected with food? I always craving for chocolate and sweets. 6.30 am - bones pain, nousea and headache (low short time). 6.50 am - feeling like anxiety begins right now (low). 7.40 am - feeling like anxiety begins right now (stronger). 9.15 am - feeling like anxiety begins right now (low). 10.15 am - feeling like anxiety begins right now (low). 12 pm - bones pain. 2 pm - feeling like anxiety begins right now (low). 3.20 pm - 4.20 pm - feeling like anxiety begins right now (stronger). 6 pm - bones pain. 7.30 pm - feeling like anxiety begins right now (stronger). 6 am - feeling like anxiety begins right now (low), bones pain. 6.50 am - headache (low-short term). 7.40 am - feeling like anxiety begins right now (low). 8.30 am - feeling like anxiety begins right now (low). 11.10 am - feeling like anxiety begins right now (low). 2.20 pm - feeling like anxiety begins right now (low). 6.30 am - feeling like anxiety begins right now (very low short time). 7.30 am - feeling like anxiety begins right now (very low - short time). 8.40 am - feeling like anxiety begins right now (stronger - short time). 10 am - very low fear, feels like something will happen (short time). 1 pm - very low fear, feels like something will happen (short time). 2.20 pm - 4 pm - feeling like anxiety begins right now (very low). 3.30 pm - very low fear (short time). 4.20 pm - very low fear (short time). 4.40 pm - feeling like anxiety begins right now (stronger), emotional instability. 5.40 pm - lethargy, hopelessness, emotional instability, bones pain. 8 pm - 8.30 pm - emotional instability. 9 pm - feeling like anxiety begins right now (very low). 7 am - strong bones pain, feeling like anxiety begins right now (low). 8 am - hopelessness, anger, feeling like anxiety begins right now. 9 am - 9.40 - feeling like anxiety begins right now (stronger). 11 am - lethargy, feeling like anxiety begins right now (low). 11.30 am - strong bones pain. 12.20 pm - feeling like anxiety begins right now. 1.30 pm - feeling like anxiety begins right now (low). 7 pm - feeling like anxiety begins right now (low). 6.30 am - bones pain, feeling like anxiety begins right now (very low - short time). 7.50 am - low fear, low internal shaking. 8.10 am - feeling like anxiety begins right now (very low - short time). 9.10 am - low fear. 10 am - feels like something will happen (short time). 11.40 am - feeling like anxiety begins right now (very low - short time). 2 pm - lethargy, hopelessness. 2.50 pm - feeling like anxiety begins right now (very low - short time). 3.40 pm - feeling like anxiety begins right now (very low - short time). 5.30 pm - feeling like anxiety begins right now (very low - short time). 7.30 pm - feeling like anxiety begins right now (very low). 8.40 pm - feeling like anxiety begins right now (stronger). 6 am - feeling like anxiety begins right now (vey low-short time), bones pain, nausea and headache (low-short time). 7.20 am - feeling like anxiety begins right now. 8.20 am - feeling like anxiety begins right now (low-short time). 9.20 am - feeling like anxiety begins right now (low-short time). 10.30 am - feeling like anxiety begins right now (low-short time). 1 pm - lethargy (low). 5.30 pm - feeling like anxiety begins right now (low-short time). 6 pm - feeling like anxiety begins right now (stronger-short time). 7.30 pm - feeling like anxiety begins right now (low-short time). 7 am - feeling like anxiety begins right now (low-short time), strong bones pain. 7.15 am - low fear, low internal shaking. 7.30 am - feeling like anxiety begins right now (low-short time), nervousness. 7.40 am - strong bones pain. 12.15 pm - feeling like anxiety begins right now (low-short time). 2.30 pm - feeling like anxiety begins right now (very low-short time). 7.30 pm - feeling like anxiety begins right now (very low-short time). 9.15 pm - feeling like anxiety begins right now (very low-short time). 5 am - feeling like anxiety begins right now (very very low short time), strong bones pain. 7.30 am - feeling like anxiety begins right now (very low - short time), very low fear, very low internal shaking. 8.20 am - feeling like anxiety begins right now (very low - short time), low fear, low internal shaking. 9.20 am- feeling like anxiety begins right now (low-short time). 10 am - strong bones pain, throat pain. 2 pm - feeling like anxiety begins right now (low-short time). 4 pm - feeling like anxiety begins right now (low-short time). 7 am - bones pain, feeling like anxiety begins right now (very very low-short time). 7.40 am - feeling like anxiety begins right now (very low-short time), low fear, low internal shaking. 8.40 am - feels like something will happen (short time). 11.30 am - 1 pm - feeling like anxiety begins right now (low - with interruptions). 1.40 pm - low fear, lethargy. 5 pm - 6 pm - low fear, feels like something will happen (with interruptions). 7.30 pm - feeling like anxiety begins right now (very very low-short time). 9.30 pm - feeling like anxiety begins right now (low-short time). Very painful bones and joints, ibuprofen does not help. At night strong bones pain, ear pain, flu symptoms. 6.20 am - feeling like anxiety begins right now (very very low short time). 7.30 am - feeling like anxiety begins right now (stronger), bones pain, low fear, feels like something will happen (short time). 10. 50 am - feeling like anxiety begins right now. 11.20 am - strong bones pain. 12 pm - lethargy, fever. 1 pm - feeling like anxiety begins right now (low-short time), emotional instability, flu symptoms. 4 pm - 5.30 pm - feeling like anxiety begins right now (stronger). 6.30 pm - hopelessness, strong bones pain, crying, emotional instability. Take ibuprofen for bones pain. 7.30 pm - flu symptoms, hopelessness, feels like something will happen. 8 am - feeling like anxiety begins right now (very very low-short time), bones pain. 8.40 am - feeling like anxiety begins right now (very low-short time). 10 am - feeling like anxiety begins right now (low - short time). 11 am - lethargy, feeling like anxiety begins right now (low-short time). 1.30 pm - feeling like anxiety begins right now (low-short time). 2.20 pm - feeling like anxiety begins right now (low-short time). 3.30 pm - 4.30 pm - lethargy, bones pain, low fear. 6 am - feeling like anxiety begins right now (very very low short time), bones pain. 9 am - feeling like anxiety begins right now (very very low), low fear, low internal shaking. 9.30 am - low fear, feels like something will happen (short time). 10 am - 11 am - feeling like anxiety begins right now (low). 12 pm - feeling like anxiety begins right now (stronger). 1 pm - emotional instability, hopelessness, crying. 2.30 pm - feeling like anxiety begins right now (low-short time). 4 pm - 10 pm feeling like anxiety begins right now (with interruptions). 6 am - feeling like anxiety begins right now (very very low-short time), bones pain, nousea (low-short time). 8 am - feeling like anxiety begins right now (very low-short time), low fear. 9.20 am - feeling like anxiety begins right now (low - short time). 10.20 am - feeling like anxiety begins right now (stronger). 12 pm - feeling like anxiety begins right now (stronger), low fear, low internal shaking, bones pain. 2 pm - like getting out of my mind, feels like something will happen, emotional instability, lethargy, hopelessness. 6 pm - low fear, feeling like anxiety begins right now (low-short time). 8.30 pm - low fear. 6 am - feeling like anxiety begins right now (very low short time), bones pain. 7 am - feeling like anxiety begins right now (very low - short time), nausea, little nervousnes (short time). 9.30 am - 11 am - feeling like anxiety begins right now (very low - short time), bones pain, emotional instability, like getting out of my mind. 12 pm - low fear, feels like something will happen (short time). 1.40 pm - very low fear, bones pain (short time). 2.10 pm - low internal shaking. 2.10 pm - feeling like anxiety begins right now (short time). 5.20 pm - low fear, feeling like anxiety begins right now (low-short time). 6.20 pm - low fear, feeling like anxiety begins right now (low - short time). 6.30 am - bones pain, feeling like anxiety begins right now (very very low - short time). Nausea and headache (low - short time). 7.20 am - low fear, feeling like anxiety begins right now (very low - short time), low internal shaking. 8 am - 8.30 am - feeling like anxiety begins right now, low fear, bones pain. 11 am - 12.30 pm - feeling like anxiety begins right now (very low - with interruptions). 3.30 pm - feeling like anxiety begins right now (very low - short time). 4 pm - 5 pm - feeling like anxiety begins right now. 7.30 pm - feeling like anxiety begins right now (very low),low fear (short time). 7.30 am - 7.40 pm feeling like anxiety begins right now (very low - with interruptions), low fear. 5.30 pm - little nervousness, hopelessness (short time). 6 pm - lethargy (short time). 5.20 am - feeling like anxiety begins right now (very very low - short time), little nervousness. 7.20 am - very low fear, feeling like anxiety begins right now (very low - short time), strong bones pain. 8.20 am - 9 am - feeling like anxiety begins right now (stronger). 9 am - 12 pm - feeling like anxiety begins right now (low). 4 pm - 5 pm - feeling like anxiety begins right now (low). 6 pm - feeling like anxiety begins right now (very low - short time). 8.30 pm - feeling like anxiety begins right now (very low - short time). I'm new to this forum. I'm hoping to begin tapering off Escitalopram by 10% sometime within the next couples of months. Just reduced from 10mg to 7.5mg in the last 2 months. Very difficult withdrawal. I just wanted to say that I think your practice of writing down your moods, sleep, etc. seems very helpful. I journal about my emotions generally, but I'm probably going to try this more detailed practice too. I bet it is helpful for just registering your moods consciously to yourself throughout the day, as well as for revisiting in retrospect to spot patterns, ups and downs, and progress. I hope you continue to do well! Maybe someone can answer me? What is that scary feeling in my chest? It is anxiety or some dysfunction of my body's organ? Can it be a spleen or adrenal glands? How it comes is connected with food? That feeling is almost always here, but sometimes the food makes it stronger. I had that feeling before when stopped Encitalopram, it was very very strong, it looked like I am gone loose my mind. It was﻿there all the time and moved around. It felt like some very fast going on engine...Later it came back less times per day, but strong as it was. With time passing by it got milder and softer, lesser times per day. As today, this feeling is milder then before, but it comes often and just in one place. I noticed, after lunch, every time and it doesn't matter what I eat, the very very mild feeling is coming back and after couple hours gets stronger, then it's disappearing...The feeling alternates all the time. I don't know if I can call it anxiety or it is something different. There is a spleen in that place, maiby it has something to do with this, I just thinking. I had that feeling, but milder, when I started pills in the begging and after six week of using them the feeling was gone. 6.30 am - feeling like anxiety begins right now (very very low - short time). 8.30 am - low fear, low internal shaking, feeling like anxiety begins right now (very low - short time), feels like something will happen (short time). 10.30 am - feeling like anxiety begins right now (very very low - short time). 6.30 pm - feeling like anxiety begins right now (very very low - short time),low fear (short time). 7.20 pm - feeling like anxiety begins right now (very very low - short time). 9.30 pm - feeling like anxiety begins right now (very very low - short time). 7 am - feeling like anxiety begins right now (very very very low - short time), low bones pain. 7.50 am - low internal shaking, feeling like anxiety begins right now (very low - short time). When my mother was taking Zoloft she always felt like she had something stuck in her throat, in the area of the breast bone. Today I reduce trazadone from 56 mg to 50 mg. When calculating your reduction and it isn't an easier amount to measure it is better to round up. This means that you reduce less than 10% of the current dose, not more. Reducing from 62.5mg to 56mg is a 10.4% reduction. 56mg to 50mg is a 10.7% reduction. So the total extra reduction is 1.1%. I realise that this doesn't sound like a lot of difference, but the larger reduction might end up catching up with you later, especially if you don't hold long enough now and/or you keep reducing by more than 10% of the current dose. My suggestion would be to do a longer hold this time for an extra week. Maybe two, depending on if and when symptoms arise. Your next reduction dose would be 45mg and the one after 40.5mg. The one after that works out to 36.45mg so it would be better to round up to 36.5mg. The next dose will be calculated on that amount, 36.5mg x 0.9 = 32.805mg. If it was me, I would round this up, however 0.005mg is a very small amount in relation to the total dose and you might be okay reducing by 32.8mg. Please remember though that at a lower dose even that tiny extra reduction could make a difference. 7 am - feeling like anxiety begins right now (very very low - short time), low fear, bones pain, short term air deficiency, feels like something will happen (short time). 8 am - low fear, low internal shaking, feeling like anxiety begins right now (very low - short time). 10.40 am - feeling like anxiety begins right now (very very low - short time), low fear (short time). 11.40 am - low fear, feels like something will happen, little nervousness, feeling like anxiety begins right now (very very low - short time). 1 pm - 2 pm - feeling like anxiety begins right now (stronger), I feel cold. 3. 40 pm - feeling like anxiety begins right now (short time), low fear, feels like something will happen (short time). 4.20 pm - feeling like anxiety begins right now (very low-short time), emotional instability (short time). 9 am - feeling like anxiety begins right now (very very low short time), bones pain. 10.30 am - low internal s﻿haking. 11.30 am - feeling like anxiety begins right now (very very low), feels like something will happen (short time). 12.30 pm - feeling like anxiety begins right now (low), I feel cold. 1 pm - feeling like anxiety begins right now (stronger - short time), bones pain. 1.30 pm - little nervousnes. 3.30 pm - low fear, feeling like anxiety begins right now (very low - short time). 4.30 pm - feeling like anxiety begins right now (stronger). 5 am - bones pain. 8 am - 12 pm feeling like anxiety begins right now (very low - with interruptions). 8.30 am - low internal shaking, short - term air deficiency. 2 pm - feeling like anxiety begins right now (stronger), I feel cold. 4 pm - 5 pm - feeling like anxiety begins right now (very low). 6 pm - hopelessness, crying. 7 pm - low fear, low internal shaking. 7.30 pm - feeling like anxiety begins right n﻿ow (very low). 9 pm - strong bones pain. 7 am - strong bones pain, feeling like anxiety begins right now (very very low - short time). 8 am - low internal shaking, low fear. 9.40 am - little nervousness, very thirsty. 2 pm - feeling like anxiety begins right now (very very low - short time). 6 pm - feeling like anxiety begins right now (very very low- short time). 6 am - 9 pm feeling like anxiety begins right now (very low - short time - with interruptions). How can I write more lines in a drug signature? Here you go. Please check that it is correct. Thank you very much. In the signature I wanted to write more lines, but I can't. Writes that too many lines. I missed - 18 November - 62 mg (trazadone). And how do I write in the future? There is a limited amount of lines that you can use. I've added 18 Nov so you can just copy and paste what I have done into your signature. It will be easier to read if you put the Trazodone on a new line. Thee are many existing topics on this site. I like to use google and add survivingantidepressants.org to my search term. I suggest you do this next time you have a simple question like the previous one. If you can't find anything then ask here in your Introduction topic. 8 am - feeling like anxiety begins right now (low). 9 am - low fear, feels like somethin﻿g will happen ﻿(short time). 11.30 am - feeling like anxiety begins right now. 12.20 pm - low internal shaking. 12.45 pm - 1.30 pm - feeling like anxiety begins right now. 4 pm - feeling like anxiety begins right now (very low), bones pain. 6.40 pm - feeling like anxiety begins right now (very very low). 8 pm - feeling like anxiety begins right now (very low). 9 pm - feeling like anxiety begins right now (very very low). 7 am - 8.20 pm - feeling like anxiety begins right now (very low with interruptions). 8 am - low internal shaking, low fear, feels like somethin﻿g will happen ﻿(short time). 10.30 am - little nervousness, bones pain. 6 am - 8.20 pm - feeling like anxiety begins right now (very low with interruptions). 7.30 am - low fear, short-term air deficiency. 10 am - hopelessness, cryin﻿g, lethargy, little nervousness (short time). 1 pm - lethargy (short time). SLEPT FOR ABOUT 7 HOUR﻿S. 7 am - 9 pm - feeling like anxiety begins right now (very low with interruptions). 9.20 am - little nervousness. 10 am - lethargy (short time). 11 am - lethargy, crying, anger, hate speech (about 1 hour). 12.30 pm - low fear, feels like somethin﻿g will happen ﻿(short time). 1 pm - lethargy (low-short time). 3 pm - lethargy (short time). 4 pm - lethargy (short time). SLEPT FOR ABOUT 6 AND HALF HOUR﻿S. 6.30 am - 9 pm - feeling like anxiety begins right now (very low with interruptions). 10.30 am - low internal shaking. 1 pm - low fear (short time). 2 pm - lethargy (low-short time). 4.30 pm - lethargy (low-short time). 5.40 pm - lethargy (low-short time). 7 pm - lethargy (low-short time). SLEPT FOR ABOUT 8 HOUR﻿S. 6.30 am - 9.30 pm - feeling like anxiety begins right now (very low with interruptions). 7.30 am - low fear, low internal shaking. 8.40 am - little nervousness, lethargy (short time). 5.40 pm - feels like somethin﻿g ﻿will happen ﻿(short time). 8 am - low internal shaking, little nervousness. 8.30 am - feels like somethin﻿g ﻿will happen ﻿(short time). 2.20 pm - low fear, feels like something will happen (short time). 4.20 pm - cryin﻿g, hopelessness (about 1 hour). 6.30 pm - I took probiotics. 6.40 am - 8.40 - feeling like anxiety begins right now (very low with interruptions). 8.20 am - low fear, feels like somethin﻿g ﻿will happen ﻿(short time). 12.30 pm - very low internal shaking. 7 pm - I took probiotics. 7.40 am - 8 pm - feeling like anxiety begins﻿ right now (very very low with interruptions). 7.40 - very low internal shaking, very low fear (short time). 5.20 pm - very low fear, feels like somethin﻿g ﻿will happen ﻿(short time), little nervousness. 7.30 pm - lethargy (low-short time). SLEPT FOR ABOUT 5 HOUR﻿S. 7 am - 9.30 pm - feeling like anxiety begins﻿ right now (very very low with interruptions). 7.50 am - very very low fear. 12.20 pm - very very low fear. 12.40 pm - very low internal shaking. very low fear (short time). 1 pm - feels like somethin﻿g ﻿will happen ﻿(short time). 6.30 pm - lethargy (low - short time). ﻿ 7 am - 8 pm - feeling like anxiety begins﻿ right now (very very low with interruptions). 7.40 am - very low bones pain. 10. 40 am - very low internal shaking. 11.20 am - very low feels like somethin﻿g ﻿will happen ﻿(short time), little nervousness. 11.30 am - lethargy (very low - about 1 hour). 2.30 pm - lethargy (very low - short time). 7.30 pm - I took probiotics. SLEPT FOR ABOUT 7 AND HALF HOUR﻿S. ﻿﻿7 am - 5 pm - feeling like anxiety begins﻿ right now (very very low with interruptions). 7.20 am - very very low fear, feels like something will happen. 7.40 am - short-term air deficiency, low bones pain. 8.20 am - feels like something will happen, very low fear, low internal shaking, little nervousness (short time). 9.40 am - feels like something will happen, very low fear, low internal shaking (short time). 11 am - low fear, low internal shaking, feels like something will happen (short time). 11.40 am - anger, hate speech, crying, low lethargy (short time). 1.10 pm - little nervousness. 3 pm - very low fear, very very low nervousness. 3.30 pm - very low lethargy (short time). 4.10 pm - very low fear, feels like something will happen, little nervousness. 5.20 pm - very low lethargy, anger, hate speech (short time). 6.10 pm - very low lethargy (short time). 7 pm - take probiotics. 7 am - 7.30 pm - feeling like anxiety begins﻿ right now (very very low with interruptions). 7.20 am - feels like something will happen, low internal shaking (short time). 8 am - very low fear, low internal shaking, very low lethargy (short time). 1.50 pm - very low lethargy (short time). 7.30 pm - take probiotics. 7.40 am - feels like something will happen, low internal shaking (short time). 8 am - 7 pm - feeling like anxiety begins﻿ right now (very very low with interruptions). 8.20 am - low bones pain. 10 am - very low internal shaking. 7.50 am - 9.30 pm - feeling like anxiety begins﻿ right now (very very low with interruptions). 8 am - very low internal shaking. 8.30 am - very low lethargy (short time). 10.20 am - very low nervousness. 12.20 pm - very low nervousness, emotional instability (short time). 2 pm - very low lethargy (short time). 7.10 pm - very low fear. Your sleep looks pretty good. Do you want to reduce trazodone by 5mg next week? Have you tried fish oil and magnesium supplements? I would love to lower the dose of Trazadone next week. I could take 25mg of tablet (it is easy 50mg split to half) and 20mg of liquid. I was taking a fish oil for two months in July and August. I never tried a magnesium. I am taking a probiotics for now. 6 am - very low fear, feels like something will happen, bones pain. 8.10 am - very low fear. 9.10 am - feels like something will happen, very low internal shaking (short time). 11.10 am - very low fear, very low internal shaking (short time). 11.40 am - very low internal shaking (short time). 12.50 pm - very low lethargy (short time). 7.10 pm - very low lethargy (short time). 10 pm - low bones pain. 7 am - 8 pm - feeling like anxiety begins﻿ right now (very very low with interruptions). 11 am - very low lethargy (short time). 1.30 pm - low bones pain, low ear and throat pain (short time). 3.30 pm - very low nervousness. 6.30 pm - take probiotics. 7.10 pm - very low lethargy (short time), bones pain. 9 pm - bones pain (short time). ﻿7 am - 9 pm - feeling like anxiety begins﻿ right now (very very low with interruptions). 10.20 am - very low lethargy (short time). 11.20 am - very low lethargy (short time). 12.20 pm - very low nervousness. 2 pm - very low feels like something will happen, very low nervousness. 3.15 pm - low bones pain, very low lethargy. 5 pm - very low nervousness, very low lethargy (short time). 5 pm - low bones pain. 7 pm - low bones pain. 5.40 am - 9.40 pm - feeling like anxiety begins﻿ right now (very very low with interruptions). 7.30 am - very low internal shaking (short time). 3 pm - very low lethargy (short time). 4 pm - very low nervousness (short time).